According to an OpEd in the NY Post by John Lott and Michael Weisser that cites a report by the Crime Prevention Research Center, America doesn't lead the world in mass shootings. I don't think it would be a particularly controversial claim to say that the US has lower gun violence rates (including lower mass shooting rates) than impoverished countries. However, the claim that Norway, Finland and Switzerland have higher mass shooting rates than the US leaves me skeptical due to the large disparity in overall gun violence. Does the US not have a higher mass shooting rate than Norway, Finland or Switzerland? Do the above numbers, as presented, accurately depict the reality of mass shootings? As discussed in this answer and this answer when you use a term like "mass shooting", your results become particularly sensitive to your definition. Additionally, results will be sensitive to search strategy, since cases are assembled from searches for news reports. Because the results are sensitive to definition and search strategy, they are susceptible to bias. The authors of the OpEd are Michael Weisser, aka, "Mike the Gun Guy", and John Lott, the president of the Crime Prevention Research Center the organization that publishes "The War On Guns: Arming Yourself Against Gun Control Lies". The study the OpEd references was conducted by the same Crime Prevention Research Center, was not peer reviewed, and does not have a coherent methods section with a well defined search strategy or case definition. To me, it reads like an undergraduate student's report or a blog post, not an academic study. Most of the section on definitions and search strategy is a discussion of perceived problems with a peer reviewed study by Adam Lankford that is beyond the scope of this claim. They start with events listed in the University of Maryland Global Terrorism Database, and then add events found using a defined nexis search and an undefined "web search", which included wikipedia. While it is possible the claim is true, the evidence used to support it is not peer reviewed or thoroughly described, and it is conducted by a biased source. In a comment, @MikhailGerasimov gave a link to the list of incidents. There is no war going on in the US. There are very few terrorist attacks there. This means that, yes, it is safer in the US than many other places. Mass shootings in the US gain massive head lines, but aren't all that common, really, compared to war zones. I jumped a bit at seeing Norway mentioned since we are a peaceful country. Looking at the list I see one single shooting. 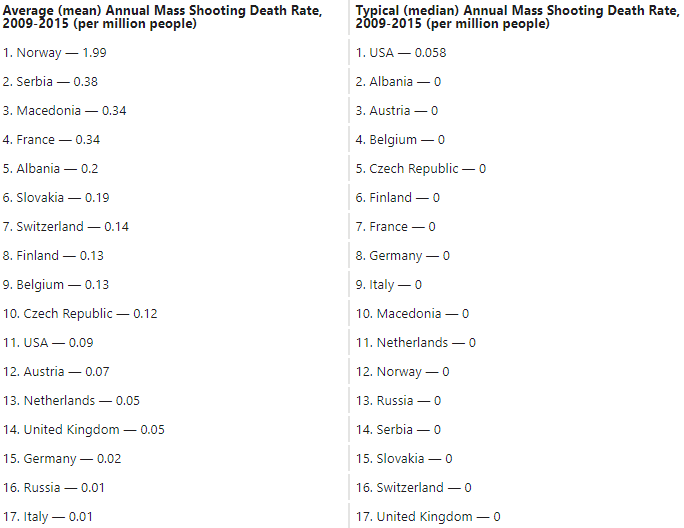 It turns out that in a small country with only 5 million people, a single shooting is enough to put us above the US. Technically correct, but hardly statistically significant. It is an interesting fact that there are very few terrorist attacks in the US. Given that they are "the great enemy" according to many terrorist organizations, one might expect there to be more. To further illustrate the point, even counting terrorism, Norway only has one significant event in the past 50 years, whereas it appears that not a day goes by in the USA without somebody shooting multiple people. According to this 2012 article on gun homicides, the average per 100k people gun homicide rate was 4.9 globally, 3.0 for the US, and 0.4 for Europe (not counting Kosovo, Montenegro, and Russia due to missing data). TL;DR? The USA has so many mass shootings that the average deaths-per-shooting is lower than other places. Let's break down what he's calculating: The rates of murder from mass public shootings per million people. This means that, when there is a mass shooting(1) in public(2), that if we account for population(3), more people are murdered(4) . By using a baseline of one mass shooting = one mass shooting, he's already removed the point of contention: that the USA has many more mass shootings than anywhere else in the world. So already, Norway with one mass shooting is being equalized with the USA, with hundreds. By specifying in public, he skews things even more in his favor. The United States does not currently have major conflicts or wars on its own soil, which he is counting towards this metric. Anecdotally, more people die in public than in private in a war, though I can't find any statistics to back that up. By making it per million people, the fact that the USA has 360-odd million people is used as an advantage against smaller European countries. More people are murdered: this is the thing he's measuring. IF there's a mass shooting, and IF it's in public, how many people die? Norway has had one mass shooting. In it, 69 people died. That's 69 murders (69/1) per mass shooting. Whereas in the US, we've had 155 mass shootings and 1107 killed. That's 7.14 (1107/155) murders per mass shooting. Let's use apples. I'm a farmer, and the local kids have been stealing my apples. They've stolen 100 apples over 10 incidents, for 10 per incident. However, the rats once got in and ate 15 apples. Does that make the rats a bigger threat, or the kids? I'd argue the kids (the US). They'd argue the rats (Norway). There is another issue with this study. It states: "Of the 86 countries where we have identified mass public shootings, the US ranks 56th per capita in its rate of attacks and 61st in mass public shooting murder rate". However there are about 196 countries in the world today. It is not clear whether the other 110 countries were excluded on the grounds of missing data or whether they were excluded on the grounds that they had zero mass shootings. If it is the latter, then they have been mistakenly missed from the accounting procedure and the US should be ranked 56th out of 196 not 56th out of 86. Another issue is that the FBI definition used by CPRC specifically excludes gang and drug related violence but not terrorism leading to an additional source of bias. The FBI report the CPRC reference, specifically states on page 5 that "This is not a study of mass killings or mass shootings, but rather a study of a specific type of shooting situation law enforcement and the public may face". This may decrease or increase the USA's relative ranking. However in some ways a more important point is that the total death rate from mass killings is low everywhere in the world outside of warzones. One wonders whether a greater benefit would be achieved if the attention directed to reducing mass shootings was directed instead at continuing to reduce the number of deaths due to armed conflicts in the world, addressing domestic violence or even reducing people's sugar intake. "America doesn’t actually lead the world in mass shootings"
A new report from the Crime Prevention Research Center, which one of us heads, has just finished collecting cases using the same definition of mass public shootings used by Lankford. The 2014 CPRC report counts only public mass shootings and excludes "gang fights and shootings which occur in connection with some other crime, such as robbery". They contrast their results to Everytown For Gun Safety, which does include shootings that happen in private and those which are connected to other crimes. Over the period between January 2009 and July 2014, the CPRC criteria find 25 mass public shootings with a total of 180 deaths; in the same period, Everytown finds 110 mass shootings with 560 deaths. In other words, according to CPRC's own publication, the "public mass shootings" included in their reports only cover about 32% of all mass-shooting deaths and 23% of mass-shooting incidents in the USA. The headline of John Lott's NY Post article makes a claim about "mass shootings" in general, but the only evidence it offers for that claim is research on a specific subset that covers less than a third of mass shootings. That should be enough to mark it as highly questionable, even before we get into the cherry-picking issues that have been raised in other answers. Not the answer you're looking for? Browse other questions tagged united-states guns terrorism violence statistics . Do SSRIs cause mass shootings/violence?